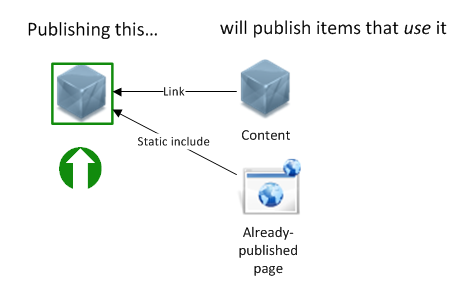 I posted how Context was part of my SDL Innovate 2014 presentation. Let me explain the ideas behind prototypes and what "templates" mean to typical knowledge workers. You've probably read before it's impossible to copy items across publications in SDL Tridion or that re-use is a good idea. I'm sharing ways to cheat this supposed restriction and when to break this guideline. Though sharing and re-use are good CMS principles to apply, they don't always apply. A classic "gotcha" is re-using a banner, image, or component across many, but not all, pages in a website. The temptation is to re-use these by placing them on many pages as component presentations (often statically). Some of my customers intentionally make copies of managed items (components or pages). Retail customers prepare weeks to months in advance of a page and related assets. To manage these in Experience Manager and publish and test well-ahead of schedule I've seen a few work on separate Content Manager items that will eventually become the "active" version on a given date. You might cringe, thinking "but that's not managed!" and you're absolutely correct. How often do you have a single physical or digital copy of these? Do these look familiar? On the Web and especially with Tridion, though you can re-use content definitions, templates, and site structure across seasonal campaign- or micro-sites, the the approval, authoring, and page placement are all fairly different which means though pages could be localized, the content is separate. Item description variations seen for multinational customers might have very similar content that you would typically localize across translated/country-specific publications, but with enough differences that separate "versions" of the content are needed. We're talking about the space between well-structured content and templating. This is the variations seen in prototypes, which is what everyone else call templates. That Word template for proposals? Prototype. Creating a new Blog post with some default rich text? Prototype. Marketings PowerPoint template? Prototype (and a theme). How do these apply to Tridion? But you need good definitions up front. You can define them before-hand or create them, but without prototypes, authors lack examples and context. Large setups with very different (internal) cliens on the same BluePrint might even copy templates. This wouldn't make sense except for cases where the chosen design and functionality is decentralized. So the central IT team can instead "release" sets of functionality. They can announce a new schema or component template and then dozens to hundreds of independent groups will slowly adopt or ignore "new" CMS functionality. To make authoring faster, more consistent, and easier, you need to start with good default, or sets of defaults. So let's start with something everyone should be familiar with, document "templates" in the form of Tridion Page Types and Content Types.